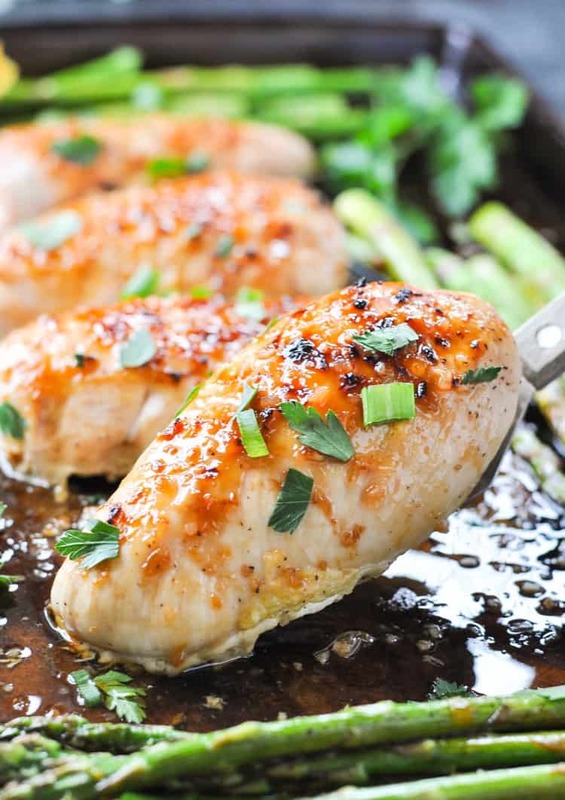 This honey apricot chicken only requires 10 minutes prep and is full of flavor! Better yet it's all made on one pan so there's less cleaning up involved too! Hey, friends! Happy Friday to you! Is it spring yet where you live? Is your asparagus in season? 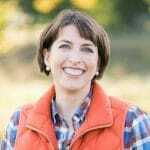 According to my unscientific observations from the grocery store produce department (and the rainy week that we’ve had), I can tell you that it’s definitely that time of year in Virginia! When I noticed the asparagus on sale at my local grocery store last weekend, I scooped up multiple pounds of the green goodness to use in dinners for the week. Plus, it was the vegetable “special” when Keith and I went out to eat at a local farm-to-table restaurant last Saturday. If it’s cheap, fresh, and delicious, you better believe that I’m going to take advantage while it lasts! Since my husband and boys wouldn’t find a tray of asparagus to be an acceptable dinner on its own, I figured that I better add some chicken to bulk up our recent supper. With half a jar of apricot preserves in the refrigerator, this meal was born! Sheet Pan dinners are the only way to go — they’re just SO easy. The best part is definitely at the end…when there is only ONE TRAY to wash. Can’t beat that! I like to pair the chicken and asparagus with a simple side dish that doesn’t require much effort, and that doesn’t utilize any additional dishes. A few slices of crusty bread works perfectly for soaking up any of the extra apricot glaze, while microwaveable pouches of rice are another handy option. 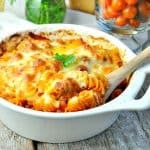 You could also try serving this with roast potatoes, mash, roasted squash, green beans, broccoli or any veg you prefer! 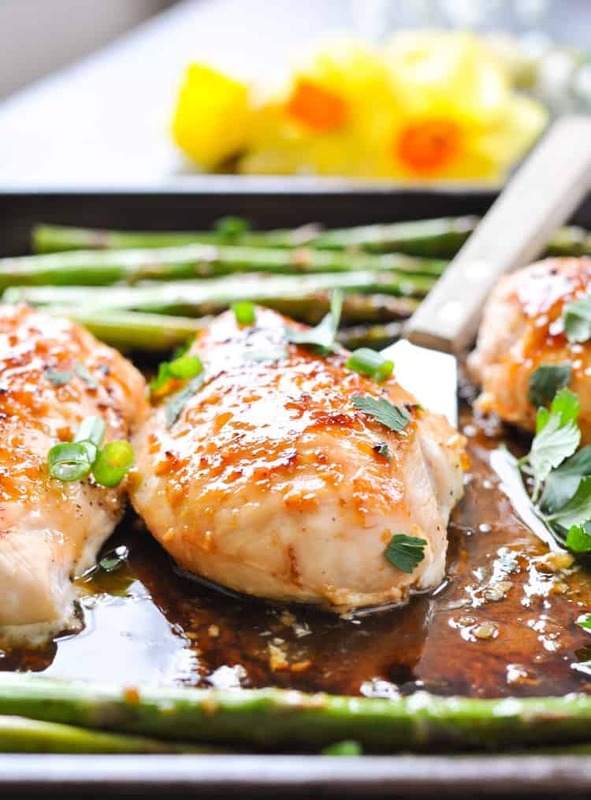 You’re going to love this preparation method for chicken and asparagus! Thanks to the sweet glaze, the chicken stays moist and tender on the inside while getting a nice, crispy char on the outside. The asparagus is tender, but still a beautiful shade of bright spring green. 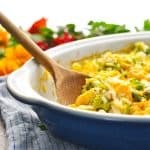 No mushy, bland veggies here! Cooking for Two? 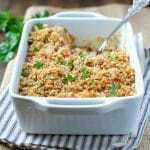 This is a perfect meal to scale down for smaller quantities. Just cook one or two chicken breasts on your tray and cut the rest of the ingredients in half as well! Want to Prep Ahead? Make the apricot sauce in advance and keep it in the refrigerator for up to one week. You can also trim and wash the asparagus ahead of time so that when you’re ready to make dinner, there’s absolutely NO prep work necessary — just place on the tray and bake! If you’re not a fan of parsley, basil is another herb that will go really well with this apricot chicken. 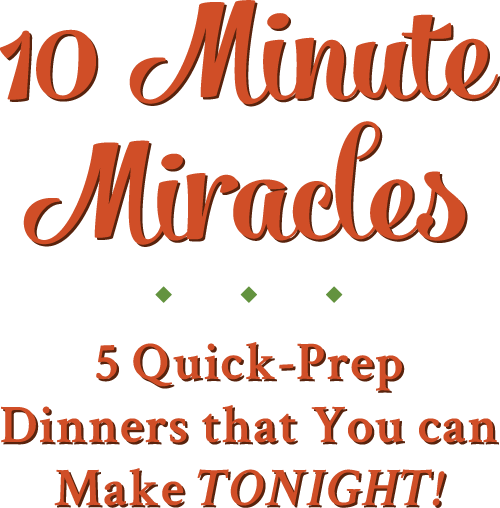 I hope that you love this new, simple dinner to add to your weeknight routine. It’s a perfect way to welcome the warmer weather! Preheat oven 400°F (200C). 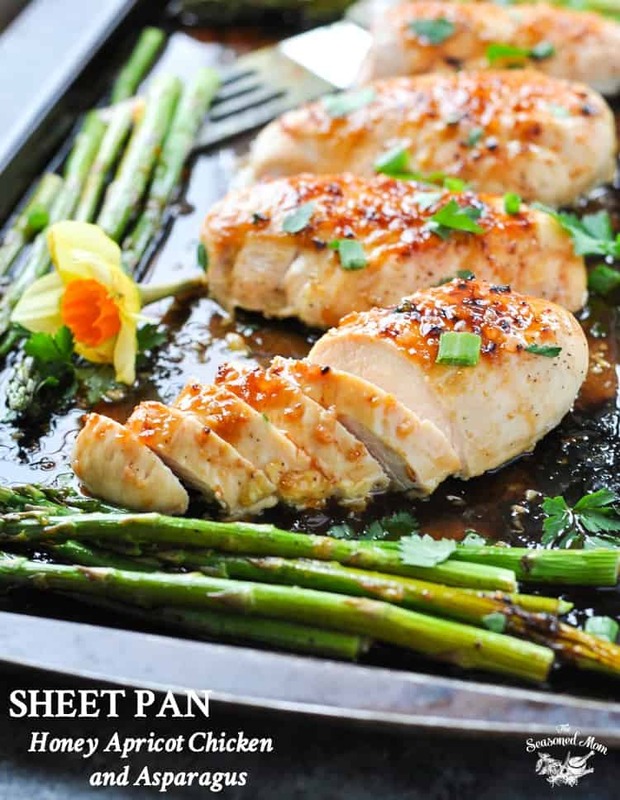 Line a baking sheet with foil and coat with non-stick cooking spray. 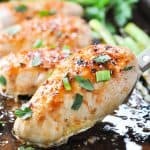 Place chicken breasts in the center of the prepared baking sheet. Season with salt and pepper. In a small bowl, whisk together orange juice, apricot preserves, honey, garlic, soy sauce, salt and pepper. Pour about ½ cup of the apricot dressing over the chicken, reserving ¼ cup for later. Bake chicken for about 20 minutes, or until almost cooked through. Remove pan from the oven and switch oven setting to BROIL. Place asparagus on the tray around the chicken. Baste chicken and asparagus with remaining apricot dressing. Place tray under the broiler and cook for an additional 6 minutes, or until asparagus is tender and chicken is crispy. Want to Prep Ahead? Make the apricot sauce in advance and keep it in the refrigerator for up to one week. You can also trim and wash the asparagus ahead of time so that when you're ready to make dinner, there's absolutely NO prep work necessary -- just place on the tray and bake! If you're not a fan of parsley, basil is another herb that will go really well with this apricot chicken. Yay for asparagus season! 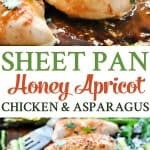 I’m in love with sheet pan dinners as it is, and this recipe only adds on to my list of ones to make! Mmmm that sweet sticky sauce! Thanks so much, Bethany! I agree — LOVE asparagus season (and one tray dinners)! do you think you could freeze this after step 4 and then defrost and proceed with the rest of the recipe? What a fun use for apricot preserves, Blair! 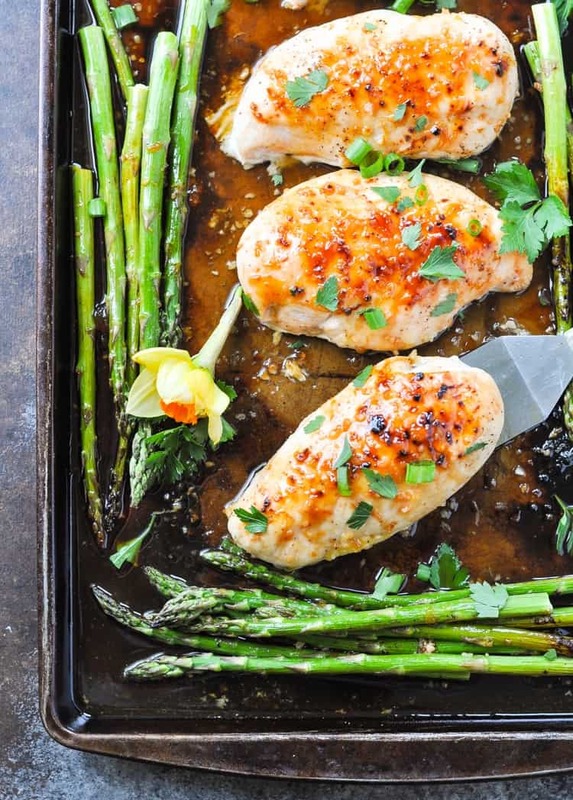 I’m always on the hunt for more sheet pan meals, so this chicken and asparagus dish is calling my name. Love the flavors of this too…sounds perfect for dinner! What a delicious combination! I know my Dad would LOVE this as he loves any kind of savoury dish that uses apricots! It always grossed me out when I was a kid – but now I totally get it! Have you ever marinated chicken in this and then baked it? Does the sauce caramelized and get gooey and burn? Hi, Melanie! I have not tried marinating the chicken in the sauce first. I think that would work fine. The sugars in the sauce definitely caramelize on the pan as it cooks, but it does not burn on the chicken. I like how the broiler finishes it off and makes it crispy at the end, but just keep an eye on it — the broiler works fast and you’ll want to take it out when it reaches the desired finish. I used as a marinade and cooked according to directions. I made this for 150 people and it was AMAZING!!! 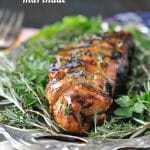 Rave reviews, great recipe, so simple. It’s a keeper! I did use simply orange juice, pulp free to simplify process. I love this one! I have had apricot chicken and honey chicken but to mix them both? Had not thought do do that! It looks absolutely amazing, your photography skills are bang on! You can almost smell and taste the chicken! I will definitely be adding this one to my to do (and enjoy) list! Thanks so much, Lee! It’s a great combo! Should I broil in low or high? Looking forward to trying tonight! I saw this recipe in a Buzzfeed article and had to try it! So glad I did, it was delicious! My husband and daughter loved it as much as I did. And the quick prep and clean-up made me even happier. Thanks! I’ll be browsing through your other recipes now! So glad I found this recipe! It was so tasty and easy to make. All 3 of my kids are it and asked for more, that is a big deal!!! Yay! Thanks, Pam! I’m so glad that you found it, too! Is there another vegetable you could substitute for the asparagus? Hey, Julie! Yes, you can use broccolini (thin broccoli) or green beans!